Here is the list of the hotels near Escoville. Book your hotel near Escoville today, Thursday 16 May for the best price, reservation and cancellation free of charge thanks to our partner Booking.com, leader in on-line hotels reservation. Below here is the list the 50 closest hotels of Escoville, sortable according your criteria. You will find the position of these accommodations on the Escoville hotels map. Located in Amfréville, Maison saint-martin d Amfreville offers free bikes, a garden and a barbecue. Guests may enjoy free WiFi. The holiday home features 1 bedroom, a living room with a TV, an equipped kitchen, and 1 bathroom with a bath and a hair dryer. The holiday home offers a terrace. Deauville is 35 km from Maison saint-martin d Amfreville. Deauville – Normandie Airport is 31 km away. Holiday home Bavent with a Fireplace 410 is located in Bavent. Guests staying at this holiday home have access to a fully equipped kitchenette. Deauville is 32 km from the holiday home. Deauville – Normandie Airport is 29 km away. Offering an outdoor pool, a 3-hectare park and free bikes, Château de Béneauville is located 7 km from Cabourg and 15 km from Caen. Free WiFi access and free parking are available on site. Offering a view of the park, the elegant guest rooms include a private bathroom with bath, bathrobes and toilet, and a sofa. A safe and tea/coffee making facilities are also at your disposal in the rooms. Breakfast is included and served every morning, and during sunny days you can enjoy the terrace. Guests are invited to visit the WWII memorial sites and the landing beaches. The beach is just 5 km away and several golf courses can be found within 7 km. Deauville is 30 km away, Honfleur is 45 km away and Bayeux is 40 km away. The property is accessible via the A13 motorway, which is 11 km away. Village Vacances Ma Normandie by Popinns is located 6 km from the coast in the Normandy village of Brévilles-les-Monts. It offers Wi-Fi in reception and guest rooms with a private shower room. Guests of Ma Normandie by Popinns can relax in the bar, games room or lounge. The restaurant serves regional cuisine. The village-club is situated 20 km from Caen and 10 km Cabourg. Free private parking is also provided. Boasting a garden and a terrace, La Glycine is situated in Bénouville, on the Normandy coast. 500 metres from Pegasus Bridge, the hotel offers a shared lounge and a bar. Free WiFi is provided. La Gylcine's guestrooms are all soundproofed and have a flat-screen TV. Guests at La Glycine can enjoy a continental breakfast. There is an in-house, air-conditioned restaurant, which serves a variety of French dishes. There is also a lounge with fireplace. The location of the hotel offers the opportunity to visit Caen and its historical region. Guests at the accommodation will be able to enjoy activities in and around Bénouville, like cycling. The nearest airport is Deauville – Normandie Airport, 27 km from the property. Boasting a garden, Manoir'Hastings offers accommodation in Bénouville, less than 1 km from Pegasus Bridge. Featuring a restaurant, the property also has a terrace. Guests can enjoy garden views. All rooms at the hotel are equipped with a seating area. With a private bathroom, rooms at Manoir'Hastings also have free WiFi. At the accommodation each room has a desk and a flat-screen TV. Deauville – Normandie Airport is 35 km away. Situated in Bénouville, less than 1 km from Pegasus Bridge, La Palmeraie has a garden. The property features garden views and a sun terrace. All guest rooms in the hotel are fitted with a flat-screen TV. The private bathroom is equipped with a bath or shower, free toiletries and a hair dryer. The rooms will provide guests with a desk and a kettle. A continental or buffet breakfast can be enjoyed at the property. Guests at La Palmeraie will be able to enjoy activities in and around Bénouville, like cycling. The nearest airport is Deauville – Normandie Airport, 35 km from the property. Bed and Breakfast Sallenelles Preferred hotel ! Offering a sun terrace and views of the garden, maison de la baie is set in Sallenelles. This B&B features free private parking on site. There is luggage storage space at the property. Deauville is 25 km from maison de la baie, while Honfleur is 38 km from the property. The nearest airport is Deauville – Normandie Airport, 24 km from maison de la baie. 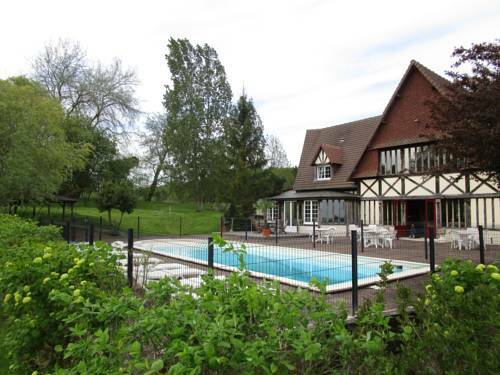 Le Clos Tranquille is located in Gonneville-en-Auge, 29 km from Deauville. Honfleur is 43 km from the property. Free WiFi is offered and free private parking is available on site. There is a seating and/or dining area in some units. Some units also have a kitchen, equipped with an oven, a microwave, and a toaster. Le Clos Tranquille also includes a barbecue. From May to September, bread can be delivered on Saturdays and Sundays. In July and August, bread can be delivered every day. Caen is 19 km from Le Clos Tranquille. Featuring barbecue facilities, a garden, and a terrace, Vacation Home on Rue du Marais 5 offers accommodation in Petiville with free WiFi and garden views. The holiday home is in an area where guests can engage in activities such as horse riding and hiking. This holiday home comes with a kitchen, a seating area, and a flat-screen TV. The property also has 1 bathroom with a shower, and free toiletries and a hair dryer are featured. Deauville is 30 km from the holiday home. The nearest airport is Deauville – Normandie Airport, 26 km from the property. This Best Western is located in Ouistreham, 2 km from the ferry terminal and 7 km from Normandy's famous landing beaches. Guests can enjoy the outdoor heated pool. It offers en-suite guestrooms with lift access, LCD satellite TV and free Wi-Fi. Guests can relax in the hotel’s lounge with a free newspaper. Hotel Best Western La Mare O Poissons is situated 2 km from the D515 which connect to Caen. Free private parking is provided. Ferme De La Riviere is located in Petiville. Free WiFi is featured. A continental breakfast is served every morning at the property. Hiking can be enjoyed nearby. Deauville is 29 km from the bed and breakfast, while Honfleur is 49 km from the property. The nearest airport is Deauville – Normandie Airport, 26 km from Ferme De La Riviere. Hotel Ouistreham Preferred hotel ! Hôtel le phare is located in Ouistreham. Among the various facilities of this property are a terrace, a shared lounge and a bar. Free WiFi is available. Guest rooms in the hotel are fitted with a flat-screen TV. Hôtel le phare offers certain rooms that have sea views, and every room is fitted with a private bathroom and a wardrobe. A continental breakfast is available every morning at the accommodation. At Hôtel le phare you will find a restaurant serving French cuisine. Hiking is among the activities that guests can enjoy near the hotel. Deauville is 44 km from Hôtel le phare, while Caen is 16 km from the property. The nearest airport is Deauville – Normandie Airport, 40 km from the accommodation. Le Normandie is located in the centre of the historical resort of Ouistreham, 200 meters from the ferry terminal and 10 minutes from Caen and its famous Memorial for Peace. The hotel offers a summer terrace and a restaurant with traditional cuisine and seafood. Free Wi-Fi internet access is available in all guestrooms and free parking is available on site. La Cabane des Marées is located in Varaville, 20 km from Deauville and 34 km from Honfleur. Free private parking is available on site. The accommodation has a flat-screen TV. You will find a coffee machine in the room. Caen is 18 km from La Cabane des Marées, while Trouville-sur-Mer is 21 km away. Deauville – Normandie Airport is 19 km from the property. Le Vauban is a charming hotel, located just 5km from Cabourg on the Normandy Coast. It offers comfortable accommodation just 800 metres from the beach, and a bar. Every morning a buffet breakfast is available in the lounge area. Free Wi-Fi can be accessed in the entire hotel and newspapers are provided. The area is famous for its sandy beaches and its casinos. Local activities also include kite surfing 800 metres from the property, and golf, 2 km away. The flower coast and the D-Day landing beaches are within close proximity of the hotel. For guests arriving by car, free private parking is available onsite. Villa L'Aigrette, a property with a garden, is located in Merville-Franceville-Plage, 1.3 km from Merville Battery. Guests staying at this villa have access to a fully equipped kitchen. Providing access to a terrace, the villa consists of 3 bedrooms. A TV and DVD player are available. Deauville – Normandie Airport is 28 km from the property. Situated in central Ouistreham, this ibis Styles property is just 500 metres from the beach and the fishing harbour. It offers en suite rooms with elevator access and free internet access. Buffet breakfasts are served every morning at ibis Styles Ouistreham. The restaurant is open for dinner between Monday and Friday. The beaches at Ouistreham were codenamed Sword Beach in the WWII Normandy landings. Ouistreham ferry terminal is 650 metres from the hotel and provides ferry connections to Portsmouth. Caen SNCF Train Station is 15 km away. Set in Ouistreham, chez André et Marie pierre has free bikes and BBQ facilities. Facilities include a sun terrace and free WiFi is available. The units in the bed and breakfast are equipped with a flat-screen TV. Chez André et Marie pierre offers some rooms with garden views, and every room comes with a coffee machine. Guest rooms will provide guests with an oven. A continental breakfast is available every morning at the property. Deauville is 42 km from the accommodation, while Honfleur is 57 km from the property. Deauville – Normandie Airport is 48 km away. Villa La Citelle is situated in Merville-Franceville-Plage. Featuring private parking, the villa is 1.7 km from Merville Battery. The villa has a TV and 4 bedrooms. There is a dining area and a kitchen equipped with a dishwasher. Guests can relax in the garden at the property. The nearest airport is Deauville – Normandie Airport, 28 km from the property. Situated 1.8 km from Merville Battery in Merville-Franceville-Plage, Villa Hélios offers accommodation with a kitchen. This villa provides a garden. Leading onto a terrace, the villa consists of 3 bedrooms. A TV is provided. The nearest airport is Deauville – Normandie Airport, 28 km from the villa. Set in Ouistreham, this apartment features free WiFi. The unit is 25 km from Deauville. Free private parking is available on site. There is a dining area and a kitchen complete with a microwave, a fridge and stovetop. A flat-screen TV is provided. Other facilities at Residence les Goelands include a hot spring bath and terrace. The surrounding area is popular for cycling. Honfleur is 38 km from Residence les Goelands, while Caen is 14 km away. A selection of activities are offered in the area, such as fishing and hiking. The nearest airport is Deauville – Normandie Airport, 27 km from the property. Located in Colleville-Montgomery, Lebon'appart is a self-catering accommodation featuring free WiFi access and BBQ facilities. Free bicycles are available to discover the area and the property is 3 km from the sea. The apartment features a living room with a flat-screen TV, a terrace and ironing facilities. The private bathroom is fitted with a shower and a hairdryer. You can prepare meals using the apartment’s kitchenette, which is equipped with a dishwasher and a microwave. 2 bikes are available to rent at the property upon request. The property offers free private parking and Ouistreham is 4 km away. Set in Merville-Franceville-Plage in the Lower Normandy region, Apartment Les Maisons de la Mer has a terrace. Guests staying at this apartment have access to a fully equipped kitchenette. The apartment is fitted with a TV and a living room. Merville Battery is 2.2 km from the apartment. The nearest airport is Deauville – Normandie Airport, 27 km from Apartment Les Maisons de la Mer. Situated 2.1 km from Merville Battery, Chez Gigi is in Merville-Franceville-Plage and features a garden and a terrace. The property has city views. The bed and breakfast comes with a flat-screen TV. A continental breakfast can be enjoyed at the property. If you would like to discover the area, hiking is possible in the surroundings. The nearest airport is Deauville – Normandie Airport, 27 km from the bed and breakfast. Hotel Merville-Franceville-Plage Preferred hotel ! Ideally located on the Normandy coast, between Ouistreham and Cabourg, Chez Marion offers comfortable rooms with a warm and modern atmosphere only 80 metres from the beach. Rooms at the hotel are equipped with modern amenities such as a flat-screen TV. The private bathrooms feature a shower, toilet and free toiletries. Free private parking is provided, making the hotel the perfect base for exploring Normandy by car. Discover the Mont Saint-Michel, the Bridge of Normandy and many other sites. The hotel is 7.4 km from Cabourg and 13.5 km from Ouistreham. Located 200 metres from the beach, in Merville-Franceville, this residence features a heated, covered swimming pool open and heated from April to November, and a children’s playground. Free WiFi and free private parking are available on site. Each self-catering apartment at Residence Le Bois Flotté includes a fully equipped kitchen with oven, dishwasher and electric kettle. You will also find a dining area and a living room with an LCD TV. Barbecue facilities are at your disposal on site and a private terrace with pool view is available for all of the apartments. A free baby kit including baby cot, bath, high chair, hanging table and bottle warmer can be requested at the reception. You can play golf 3 km away or do water sports 500 metres from Residence Le Bois Flotté. Cabourg is 5 km away and Deauville is 30 km away. Caen Train Station is a 20-minute drive away. Appart'City Caen offers apartments and studios in the heart of Basse-Normandie. It is 12 km from the sea and the D-Day Landing Beaches from WWII. Decorated in a contemporary style, the apartments and studios at Appart'City feature a TV with satellite channels. Some have a separate seating area and all have a work desk with free internet access. A continental breakfast is served every morning in the residence’s breakfast room. Breakfast is composed of various breads, including gluten-free bread, pastries, fresh and hot beverages. Fresh fruit and fruit salad, as well as cheeses and yogurts are also provided. Meals can also be prepared in the kitchenette, which features a dishwasher, hot-plates and a microwave. The residence can be accessed from the N814. The city’s tram stops outside Appart'City and goes directly to the centre in 10 minutes. Situated in Ouistreham in the Lower Normandy region, Apartment Avenue Pierre Corneille has a balcony. Guests staying at this apartment have access to a fully equipped kitchen. The apartment is equipped with a TV. Deauville is 45 km from the apartment, while Caen is 17 km from the property. The nearest airport is Deauville – Normandie Airport, 41 km from Apartment Avenue Pierre Corneille. Boasting accommodation with a balcony, Apartment La Côte Fleurie.2 is situated in Merville-Franceville-Plage. The Merville Battery is within 2.3 km of the apartment. This apartment is equipped with 1 bedroom, a fully equipped kitchenette, a dining area and a flat-screen TV. The nearest airport is Deauville – Normandie Airport, 27 km from the property. Below here is the hotels map of Escoville. Names and details of Escoville hotels can be shown on the map clicking on the prices icons.